Durasol’s SunGuard® window awnings add style and flare to your home’s exterior. 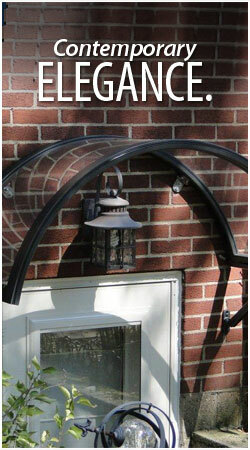 There is no shortage of options with Durasol window awnings! The Romanza is a new European style awning with an exciting contemporary fair. This stationary door and window awning is available in four distinctive styles. All four designs utilize similar components constructed of heavy-duty extruded aluminum with polyester powder coating. The special polycarbonate panels provide superior weather protection while allowing light to flter through.